Forest Hill Society: Give Us back Our Walrus! In May this year the Horniman Walrus went to Margate to take part in an exhibition at the Turner Contemporary Museum. His departure has left a large gap in the museum, and in our hearts. He is sending regular postcards to the museum and children visiting the Horniman are encouraged to send him postcards (they were cutting edge technology when he was born in the 19th century). 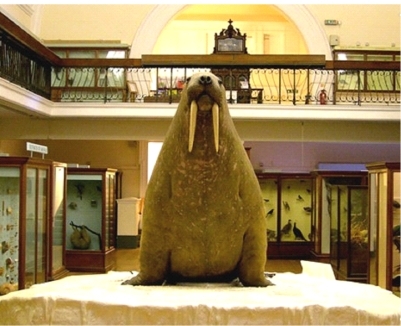 However, he's no Luddite, so you can also follow @HornimanWalrus on Twitter. Despite assurances that he will return in September, the Forest Hill Society is considering what action to take to help this poor peripatetic pinniped. Even after watching 70s comedy One of Our Dinosaurs is Missing, the executive has not ruled out rescue attempts of the one ton animal. But we all need a trip to the seaside occasionally and he has been stuffed in the museum for more than 100 years, so he is probably due a holiday.